Orfibrace NS is a unique rigid and supportive material for your patients. Its high resistance to stretch offers you excellent control while molding. It has a superior surface finish. Orfibrace NS is unique in that it can be activated in a splint pan or in the oven, according to its coated surface. Easy to trim and smooth edges. Easy handling and control of material during moulding. Very strong material which holds its shape perfectly against increased tone. Excellent for all mechanical attachments. Remouldable. Splints can be adjusted easily after local reheating. Coating eliminates accidental bonding. Material will not stick during moulding onto bandages. 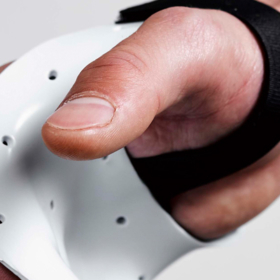 Allows to apply pressure during the fabrication of the orthosis. Comfortable and pleasant surface feel, which stimulates patient compliance. Ideal for all large and rigid orthoses. Well-suited for trunk corsets, ankle supports, elbow, forearm and wrist orthoses. Ideal material for permanent bracing. Excellent material to fabricate anti-spasticity orthoses. Ideal to mould onto positive plaster moulds protected by a cotton lining. This pre-cut offers a flexible and reliable independence for your patient without risk of pressure wounds at the heel. The Orfibrace NS A.F.O. pre-cut is available in 4 sizes (XS, S, M and L).